Downtown Clayton has been booming with new development projects in the last couple years, including 212 South Meramec, a 26-story apartment building, and a new hotel planned for the old Clayton Police Headquarters building. The City of Clayton passed a TOD Overlay Code for both Clayton and the area around the Forsyth MetroLink Station. This code encourages denser, mixed-use developments through mechanisms like no maximum building height and no minimum parking requirements, but requiring connections to the MetroLink Station and streetscape and greenspace improvements. A few of the recent projects around the Clayton MetroLink Station have used this Overlay Code, as has a new project that is coming to life near the Forsyth MetroLink Station. Centene Corporation, a large health care company based out of downtown Clayton, is expanding its headquarters in one of the largest development projects in Clayton’s history. The $770 million Centene Centre will include a 27-story office building, a 17-story residential/hotel building, and a civic center with a full-scale auditorium, as well as a 12-story parking garage, covering the area from South Hanley Road to Forest Park Parkway, just south of Forsyth Boulevard. The 550,000 square-foot office building is already 96 percent leased due to the large area taken up by Centene Corporation, as well as other tenants like Armstrong Teasdale, JP Morgan, Cushman Wakefield and Stinson Morrison Hecker. The development will include a public, pedestrian-oriented plaza with landscaping, outdoor seating, a waterfall and a fire pit. The plaza also strives to be LEED certified, and features artwork, including an illuminated colored glass canopy connecting the garage to the office tower. The apartment tower, which sits just north of the Ritz-Carlton hotel, was recently approved for 17 stories, including ground floor retail, 15 floors of multi-family units and a top floor penthouse. A civic center and auditorium will be part of the final phase of the development, and is planned to be used as a Centene training center and a site for cultural events. The design of the structure includes large windows facing the Forsyth MetroLink Station, and a landscaped sidewalk leading to the entrance of the building, making it easy and attractive for people to travel using Metro Transit. Clayton Mayor Harold Sanger sees the benefit these projects have on downtown Clayton. In total, the project is planned to include more than 1 million square feet of office space and 97,000 square feet of retail, residential condos, a 200-room corporate hotel, an auditorium, 285,000 square feet of mechanical and support space, and 1.9 million square feet of structured parking. The Centene Centre expansion will deliver 2,000 jobs, 1,000 of which would be new to Missouri. 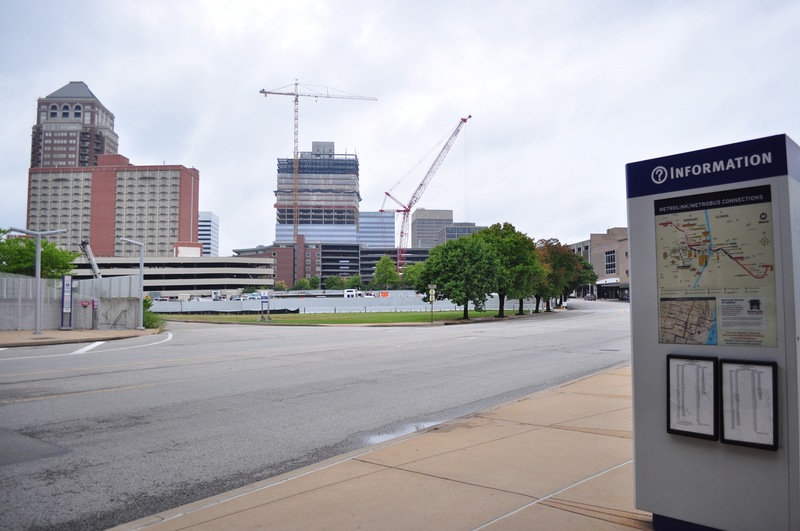 All phases of the project are focused on creating an enhanced, attractive and pedestrian-friendly environment that encourages people to connect with Metro Transit and enjoy this new, vibrant area in downtown Clayton.